pARTy@PdA! 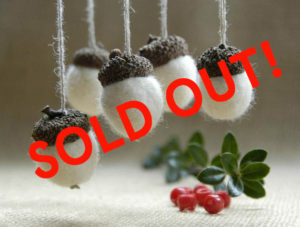 Festive Felting – SOLD OUT! Get a kick start on the holiday celebrations with this fun and crafty event! In a social and relaxed atmosphere, learn basic techniques of wet felting from our community engagement specialist and fibre artist Catherine Dumaine. Then create your own felted keepsakes or gifts while enjoying complimentary sweet and savory tidbits and, perhaps, a glass of wine (cash bar). With the knowledge you gain, you can continue making felted items at home! Browse our Christmas Boutique while you’re here and receive a 10% discount on your purchases of locally handcrafted artisan wares.